Originally posted on Smart As A Fox, written by Sandi Fox. 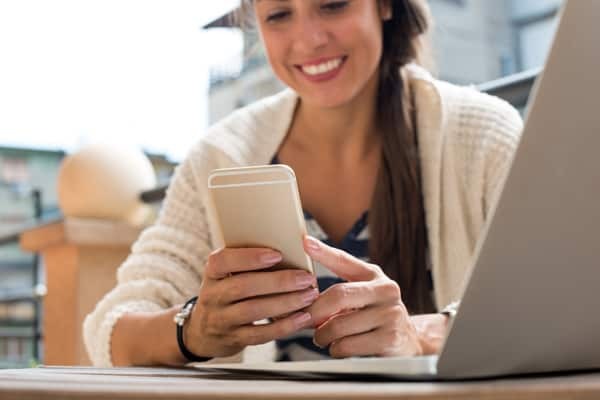 More and more nonprofit organizations and campaigns are realizing they need to include mobile (SMS) text messaging in their digital and campaign strategies. There are two types of mass texting that can be utilized by your organization. Broadcast SMS has been around for 10+ years but didn’t begin to be utilized by major organizations and campaigns until after 2012. 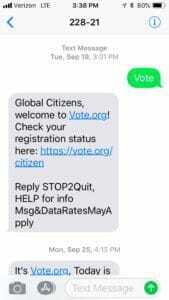 Whereas Peer-to-Peer SMS made its first appearance during the 2016 election and is that “bright new shiny object” that organizations all feel they should be using because their major donors or board members keep asking. Both of these mobile (SMS) methods can increase your ability to engage and have an impact, but they need to be used strategically and have specific use cases. When used correctly, they can complement each other. However, often I see organizations using peer-to-peer inefficiently, leading them to use valuable staff time and pay more money then they would if they used a broadcast tool for the same tasks. You need to be always aware of your resources: people, time, and money. Here is a basic breakdown on the differences between them. HOW: Person must manually send each individual message. A person can use the application/platform to send one message to multiple people. 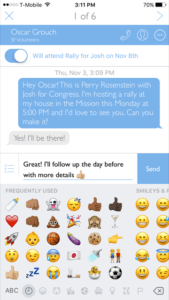 FUNCTIONALITY: Basic text SMS with emojis, custom fields, etc. SMS & MMS (graphic & gifs), logic-based messages, patch-through calling, custom fields, etc. An application-to-person broadcast mobile platform can be similar to a fully functioning CRM you might use for email (Panorama, Mobile Commons, Revere Suite, etc.). Only instead of sending an email message, you are sending a 160 character text or a logic-based text thread to your list, which allows you to engage and have an automated back & forth conversation with your supporters. That being said, there are some more basic barebones broadcast platforms that are just built for you to ONLY send a broadcast SMS to a large list. Broadcast messages MUST be sent from a 6 digit short code that has been approved by all the mobile carriers for mass texting purposes. If you come across a broadcast mobile SMS provider that uses a regular phone # or long code to send text messages then your SMS messages are more likely to be blocked by carriers who mark mass texts as spam because it’s an FCC violation. A Peer-to-peer mobile platform is both on a web platform and a mobile app. You set-up the messages and the lists via the platform, and then your staff or volunteers send each message via the mobile app to all your recipients. Peer-to-Peer messages use a 10 digit long code (i.e., a regular phone #) because they have been able to operate in what I like to call a “gray area” within the FCC regulations which say each message must be sent individually. While they do message an established list of recipients, the messages are not sent all at once, and a person is technically hitting send on each message. People: You need more people (staff or volunteers) to send out the messages. Time: You can’t send out as many messages as quickly, so peer-to-peer isn’t as great for rapid response. Money: If you need more people to send all your messages (especially if you have a time constraint), then you may need to hire staff and that costs money. People: You only need one person (and ideally a back-up) trained on how to manage your broadcast mobile program. Time: You can send messages immediately or schedule them for the exact moment you need them to go out. Money: You only need the salary of one staff person, who could also have other responsibilities outside of mobile. One of the most important differences between Broadcast and Peer-to-Peer is the requirement of an opt-in from your message recipients. Welcome to the [ORG NAME] mobile network! We’ll keep you updated on important issues. Reply STOP to Quit at any time. Peer-to-peer does not need an opt-in and is not subject to the same FCC opt-in requirements because it is not categorized as mass texting since an individual is pressing send each time. This is why Peer-to-Peer is best used for voter outreach and acquisition. You can purchase a list and send messages to your target recipients. So when considering how you plan on using each, consider who is your target audience. Is it your supporters and donors? Then you probably want to use Broadcast mobile and utilize your existing channels of communication to get them to opt-in to your mobile list. Or is it a specific group of people or voters you don’t have an existing relationship with? If so, you’ll probably want to use Peer-to-peer to reach them, provide or get the information you want, and maybe prompt them to opt-in to your Broadcast mobile list. Another core difference is how and how much you are billed by Broadcast and Peer-to-Peer vendors. The vast majority of Broadcast vendors bill by usage and have month-by-month or annual contracts. They charge you a rate based on sending a certain number of SMS messages during a particular period of time (typically a month). The monthly rate is usually a breakdown of the number of messages, overall platform costs, carrier fees and shortcode fees. The cost per text message usually is less than 2 cents and goes down if you sign an annual contract for more messages per month. Plans vary with each vendor, but you can get an annual contract for approximately, $2,000/month* to send 100,000 text messages. If you have a list of 20,000 mobile numbers and send 3-5 broadcast messages a month to that list you’ll send between 80,000 - 100,000 messages. Another thing to note is that many of the larger vendors require an annual contract. For Peer-to-peer vendors like Hustle or Relay you pay per contact #, not per message. They can charge you either approximately $0.30/month* for each contact or as low as $0.15 per contact, depending on list size, the volume of messages and length of the contract. So let’s say you have 20,000 contacts and are paying month-by-month because you only are running a 3-month campaign, then you’d be paying approximately $6,000 per month. If you sign an annual contract that might drop down to $3,000 per month, but you are also paying for the list unless you have mobile numbers already. *Some Peer-to-peer vendors now have a per message option, but it is around 10 cents per message, which is incredibly expensive (approx. $10,000/mo for 100k messages). So when you look at your resources, if you have a wealth of staff or volunteers (people), a decent budget (money), but only 2 months (time) to do the outreach you need then Peer-to-Peer is the right choice for you. As I mentioned earlier in this article, Peer-to-Peer vendors offer basic SMS functionality with the ability to create custom fields for personalization in messages, and you can add emojis. With the help of your primary CRM (ex. Panorama, NGPVAN) you can do list segmentation and targeting. There are a few smaller Broadcast vendors that only offer basic SMS and MMS messaging with a few additional functionalities. So once again, it’s important to think about your specific needs, audience, and resources to determine the appropriate mobile tool/platform to use based on the circumstances. Ask the right questions. What is your program or campaign goals? Do I plan to organize a call-in campaign? Will there be rapid response moments? Am I using mobile for advocacy, fundraising, education, or marketing? Am I reaching out to voters in a specific district for a political campaign or ballot initiative? Do I have a relationship with this audience? Do I have mobile opt-ins already? People: What is my current capacity? Do I have a staff person who can do the work and/or train volunteers? How many volunteers would I need? Am I running a 6 month or a 12-month political campaign? Is this for a special election, with only one month til the election? Is this for a long-term campaign or mobile/digital program? Money: What is my budget? Can I afford to hire contractors to send text messages? These are all significant questions you need to ask yourself when deciding whether to use a Broadcast or Peer-to-Peer platform (or both!). Hopefully, I’ve answered many questions you might have with regards to starting or running your mobile program. If you have any additional questions feel free to email me at contact@smartasafox.org. Sandi Fox is the Founder of Smart As A Fox LLC, a full service, progressive, digital strategy consulting agency. We have over a decade of experience running high-profile advocacy campaigns with some of the largest organizations in the country. We are here to help your organization, socially-minded business, or campaign advance positive social change by utilizing digital tools to mobilize your grassroots supporters. We create and deliver impactful, measurable, data-driven, integrated, digital campaigns and programs. We develop and strategically implement successful advocacy, fundraising, and/or marketing program(s). Sandi is also CEO of Smart As A Fox Mobile Messaging, which takes the industry's most powerful enterprise-grade mobile messaging platform and makes it accessible and affordable for small to mid-size nonprofits and campaigns to use. We believe that all organizations should be able to add mobile (SMS) and patch-through calling to their digital toolbox, no matter their size. We want to help you text for the greater good!